In ancient Egypt, even a lowly serf could seek an audience with the Pharaoh. 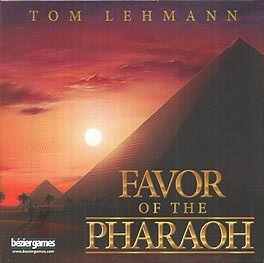 Favor of the Pharaoh is a tile-building, dice-rolling game where each player is attempting to gain Pharaohs favour. Work your way up through Egyptian society gathering dice and powers to gain entry to the next social level. Once any player gains the Queens influence, a final roll-off occurs for the Pharaohs favour.